Tom and his master the Spook are going to leave their home in Chippenham to go to the Spook's winter home, Anglezarke, in the south. Their departure is rather sudden, just after the Spook receives a communication from another spook, someone called Morgan whom the Spook once knew and whom he clearly is not happy to have heard from again. Anglezarke is a cold and dreary place, a house crammed in a dark crevasse of rock near a bleak moor. Worse still several witches are stored in its basement, one of whom is none other than the Spook's old paramour, Meg. Soon after they arrive Meg is brought out of cold storage and is allowed to become a member of the household though she must drink an herb tea which keeps her in a drugged state. As long as she drinks the tea Meg does not remember that she is a lamia witch. They are not at Angelzarke long before the Spook and Tom are summoned to rid the area of a very dangerous boggart. In the process the Spook is grievously injured. While he is recovering Morgan meets with Tom and demands that the young man steal a book which belongs to the Spook. If Tom does not do as he wishes then Morgan, who is a powerful and evil necromancer, will make Tom's poor dead father suffer. To make sure that Tom complies he shows Tom that he really can make Tom?s father?s spirit feel terrible torment. In desperation Tom agrees to steal the book. The problem is in his absence things have happened at Angelzarke. Meg the witch has managed to avoid taking her herb tea and she is now her true self. She has locked up the Spook and freed her bloodthirsty sister the feral lamia from her pit in the basement. When Tom goes back to the house Meg imprisons him too. How is Tom going to free himself and the Spook, and will he be able to find a way to stop Morgan before the necromancer summons up one of the worse dark forces imaginable? 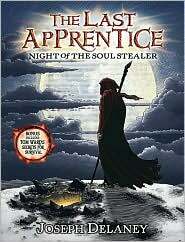 In this third book in "The Last Apprentice" series Joseph Delaney carefully reveals a little more about the intriguing and secretive Spook. We get to meet one of the women who he fell in love with long ago, and who it seems he still loves. We also get to find out a little more about his past. From Tom's Mam we learn that the Spook?s days are numbered and that Alice and Tom will be taking his place in the not too distant future. With gripping scenes involving, among other things, a stone throwing boggart, a power hungry necromancer, an evil ancient god, and a blood thirsty witch, this tale will have readers sitting on the edge of their seats, always ready to read more.